Wave after curling wave rushes inward from the deep green waters of Muscongus Bay, crashing into the fractured rocks of the shoreline and bursting ocean spray about like frothy fireworks. Safely perched above the scene on Leighton Head, we enjoy a front row seat for the awesome natural display on this magic mile of Maine coast at La Verna Preserve in Bristol. The preserve encompasses 120 acres of coastal woodlands and a long stretch of prime oceanfront, permanently protected and under the able stewardship of the Pemaquid Watershed Association. Since 1973 PWA has been involved in land and water stewardship and environmental education efforts in the Pemaquid River watershed on the Pemaquid peninsula. Minnis is the only full-time staff person in the 850-member organization, which, like most every land trust, relies heavily on volunteers to do so many critical tasks, from trail work to stuffing envelopes. The association has been successful in preserving 278 acres on 13 parcels through conservation easements. They also own and manage eight preserves totaling 358 acres, all of which sport hiking trails of various lengths. It’s a lovely road trip to the La Verna trail head, one that takes you over Route 1 through the villages of Newcastle and Damariscotta. From there follow Route 130 down the peninsula through Bristol, then take either the Upper or Lower Round Pond Road to Route 39 at Round Pond. Three miles south of the post office you’ll find a parking area and kiosk on your right. Pick up a trail map, then cross the road to access the three miles of hiking trails. Follow the Hoyt Trail quietly (landowner’s request) through private property, then cross Meadow Brook and enter the preserve proper. Here, bear left on the Ellis Trail past fields and stone walls, and over a series of footbridges, much of the time under a canopy of stately red spruce. Masters Machine Company of Bristol has adopted the La Verna trails and generously supports their ongoing maintenance, a nice local touch that keeps the paths in great shape. The trail trickles gradually down to a shelf above the ocean. As you traverse southwest, numerous lookout points afford far reaching views across the bay: to Louds Island, tiny Bar Island, Ross Island, Haddock Island and others. Look further out and you’ll recognize Monhegan Island, nine miles out to sea. Continue on at an easy grade, peeking in and out of the trees, to the folded and layered rocks at Leighton Head. There’s an undeniable feeling of wildness here amid the crashing waves and wind-whipped ocean vistas. “It feels a lot like the Bold Coast at Cutler,” remarked my wife, Fran, as we reveled in the sea views. 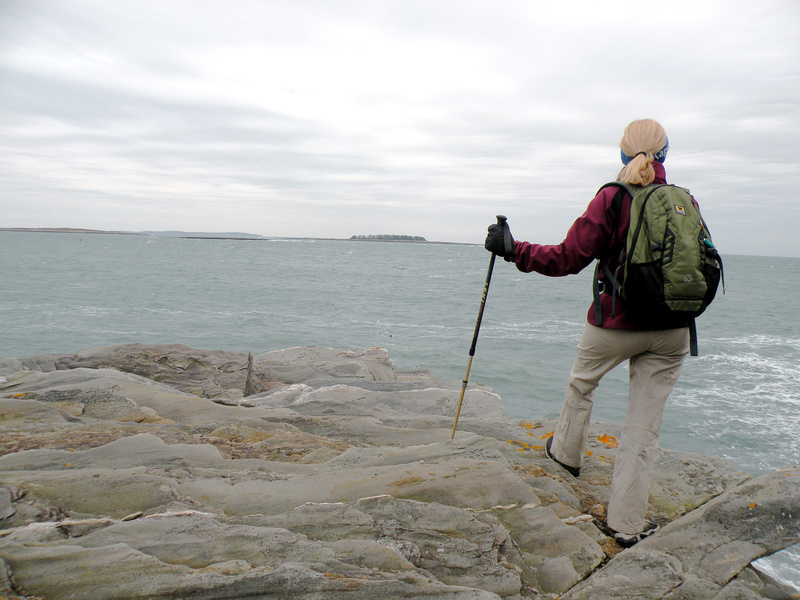 Indeed it is, with a similar rugged and remote feel, yet it’s much more accessible to southern Maine denizens like us. I can tell you about La Verna, but it’s only a story and a photo until you experience it for yourself. It’s been awhile now since I was so moved by a place, and I am happier still to have stumbled upon it by chance, as is so often the case. I trust you’ll enjoy it as well. The path continues on the Tibbitts Trail to Lookout Point, where a short detour leads out to a long rock shelf with yet more fine scenery; a sweet spot for lunch and a lazy rest. Back on the main track, turn away from the ocean and head uphill to reach an old tote road. Follow this through fragrant woods to the Main Trail and finally back to the car, closing the loop. Before leaving please do deposit the requested donation to help PWA continue its good work. Pre-hike, Hanley’s Market in Bristol is a convenient stop for last minute munchies; they make a fine tuna salad sub. Post-hike, the King Eider Pub in Damariscotta serves up excellent chow and spirits. A bonus: Reny’s Basement across the street is just the place for bargain hunters looking for deals on outdoor clothing and whatnot. For more information on PWA preserves and trails, events and programs, membership and volunteer opportunities, go to www.pemaquidwatershed.org or call 563-2196.